Purpose: Ureter avulsion, a challenging urologic complication, has been rarely found in lumbar spine surgeries. Once ignored, the leaked urine usually leads to significant morbidity and also makes further repair more difficult. We present an unusual ureter injury causing a long defect which occurred in posterior spine fusion; immediate repair was performed with minimal invasion. 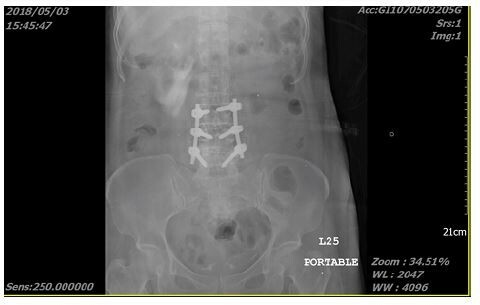 Case presentation: A 61-year-old female was receiving microscopic spine fusion (transforaminal lumbar interbody fusion) for her L3–L5 spondylosis. Ureter avulsion with one 3-cm defect occurred unexpectedly. We confirmed urine extravasation promptly, and performed end-to-end ureteroureterostomy with laparoscopy. Retrograde double-J stenting was indwelled. Her postoperative condition was uneventful. Conclusion: This rare case with good outcome highlights the importance of early diagnosis and immediate repair for complete ureter avulsion. We prove that reanastomosis for ureter loss as much as 3 cm is feasible with laparoscopy in regional hospitals where a robot is not available. To deal with large gaps between stumps, adequate kidney mobilization is required before anastomosis.